Here is a bit more information from Bing Crosby's official website regarding the upcoming CD release from Collectors' Choice Music that Chip alerted everybody to a couple months back, due for release on November 9, 2010. (The website also has additional information about the Crosby Christmas Specials DVD due for release on the same day, as well as a 7" vinyl single Crosby Christmas release). Collectors' Choice Music presents the first significant, new collection of Christmas-themed material from Bing in decades: BING CROSBY: THE CROSBY CHRISTMAS SESSIONS, a 19-track collection featuring some of his rarest and most famous Yuletide recordings. Song highlights include: unreleased versions of White Christmas; It's Beginning to Look a Lot Like Christmas; Jingle Bells, Here Comes Santa Claus (with Peggy Lee); Silent Night, duets with Ella Fitzgerald and Frank Sinatra, plus Bing's legendary 1977 duet with David Bowie. BING CROSBY - The Crosby Christmas Sessions: White Christmas; It's Beginning to Look a Lot Like Christmas; Jingle Bells (slow and fast versions); Deck the Halls/Away in a Manger/O Little Town of Bethlehem/The First Noel; Adeste Fidelis/O Come All Ye Faithful; Here Comes Santa Claus (with Peggy Lee); The Christmas Song; Sleigh Ride; and Silent Night; Bing's legendary duet with David Bowie on The Little Drummer Boy/Peace on Earth; duets with Frank Sinatra on We Wish You the Merriest and Go Tell It on the Mountain (both from the 12 Songs of Christmas album); duets with Ella Fitzgerald on Rudolph the Red Nosed Reindeer and Silver Bells; the Columbia single Just What I Wanted for Christmas and the Secret of Christmas; the Reprise single White World of Winter and It's Christmas Time Again. I wish the could have also found room for the [i]12 Songs...[/i] version of "The Secret of Christmas", as that one is (IMO, at least) much better than the Columbia one. Incidentally, and for anyone who didn't already know, [i]12 Songs of Christmas[/i] actually was reissued on CD a couple years ago, as part of a limited import-only "Christmas Edition" of Sinatra's [i]Nothing But the Best[/i] compilation. Unfortunately, the original cover art isn't part of the package and the sound quality isn't all that hot. Speaking of Der Bingle, this is completely O/T but did anyone else see this amazing story about the vintage World Series telecast that was found in his old wine cellar? As far as this new Collectors' Choice Music CD is concerned, it's truly unfortunate that with all the great classic Christmas albums out there that are still out-of-print, CCM found it necessary to release yet another Bing Crosby compilation. And even though there is unreleased material on it, I really don't care, as unreleased songs and/or bonus material by an artist -- even Bing Crosby -- should not take precedence over legitimate original LP releases. Don't misunderstand, I love Bing, and lest no one forget that it was me that put him on the Yule Log telecast when I included him in my new fourth hour that I added to the program last year. But the fact is that Bing’s Christmas music library has gotten more than its fair due. Not only are all four of Bing's original Christmas LP releases in print, but there are a slew of compilations out there; and this release by CCM -- while unique -- makes it just one more. There are so many great artists who have none of their Christmas material in print -- absolutely none, and that’s a damn shame. That’s why I was not enthusiastic at all about CCM’s plans this year for this new compilation. And now, as a result of their sole focus being fixated on this one release, a whole year has now been lost in getting some of these great classic Christmas albums back in print. This is especially disconcerting because time is running out, as CDs are fast losing popularity in the marketplace to music downloads. This Crosby compilation idea was a nice one, but we have paid a dear price for it. This 1971 album was originally titled "A Time To Be Jolly" and features the Jack Halloran Singers and the Les Brown Orchestra. It's been reissued under various titles. The one I got from Amazon is called "Bing Crosby Christmas Album" put out by Polygram. This is the entire original album, no tracks missing as is often the case with a lot of budget releases. Great album at a very low price. The 'new' cover is different....anyone on the blog get the Amazon CD? Is it worth the purchase? Seems like a bargain. This Polygram reissue CD has been in print for quite some time. And yes, I highly recommend it if you don't already have it in your collection. 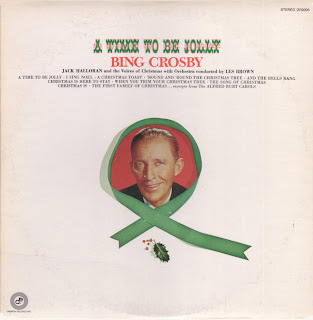 This was Bing's fourth Christmas LP, and the best all-around Christmas album he ever did. That is why I chose a selection from this album for the new fourth hour of music that I added to the Yule Log last year. Click here. Thanks, as always, most appreciated...keep up the great work! I have been revamping my digital and vinyl Christmas collection with your recommendations...hope to contribute some new insights as well. I am very fortunate to have "A Time To Be Jolly" on vinyl in NM condition. Chip already knows this and I think a few other members may too, but I prefer vinyl over CD's This is a great LP. I think I had posted the artwork in another thread and the back of the album jacket has a picture from one of Bing's Christmas Specials. I'm glad that Chip chose to use this album to add to "A Time to be Jolly" to the 4th hour. of The WPIX Yule Log. If you have the LP under its original tile, A Time To Be Jolly, then that means you have it on its original label of Daybreak Records. The original LP was issued in 1971 by Daybreak Records with the title, A Time To Be Jolly. Then, in 1977, it was reissued by 20th Century Fox Records with the new title, A Holiday Toast. Both LPs had the same artwork, front and back. As for the CD of the album, it has been released twice so far: by Mercury Records in 1993, and then by Polygram Records in 1994. However, both times with a different title, and both times with the songs in a different order from the original LP. Neither time was it ever remastered, and neither time was the original album cover artwork used. Therefore, I am still hoping that someday it gets a proper release on CD. Yes, mine is the Daybreak release from 1971. I actually came across it when I was searching specifically for Bing's version of "I Sing Noel" and in my searches, it always brought up the 1994 Polygram CD "The Bing Crosby Christmas Album" I can't remember exactly how I found that the original release was "A Time To Be Jolly" but after I found the correct title I believe I either came across this by accident at a Thrift Store or it was on eBay. Either way, it was NM condition. I can't find the thread now as I'm not sure I'm the one who started it, but in the thread I believe I posted the artwork and asking if anyone knew what year the photo on the back may have been taken as it looked like it was from one of the Christmas Specials that Bing and his family had done. I remember you mentioning that you contacted one of Bing's sons (I don't remember which one) and asked him if he remembered when the picture was taken. It was Bing's son Nathaniel that I spoke with. He confirmed that the photo on the back cover of the LP was indeed from one of the TV Christmas specials they did with their dad, but just couldn't remember which one. However, we both speculate that it was more than likely from the 1970 Christmas special. By the way, I spoke to Nathaniel recently about my addition of one of his father's songs to the Yule Log soundtrack, and how I felt that his last Christmas album, A Time To Be Jolly (which, as I said earlier in the thread, I personally believe to be his overall best Christmas LP) was always sadly his most overlooked. Nathaniel agreed, and said that the LP was definitely his most "catchy." Nathaniel is still active today in the golf industry and is still living in sunny Florida -- and loving it! I vaguely remember you stating it was Nathaniel but wasn't sure. I can't say for sure, but I think it was Nathaniel who told the news networks when they let everyone know that Bing had passed away, in 1977 but 33 years is a long time to think back. So I admit I could be wrong and it may even have been Harry. It's good to know that Nathaniel is doing well and still active in the golf industry. I agree too that "A Time To Be Jolly" was Bing's best Christmas album. Also the Duet with David Bowie "The Little Drummer Boy/Peace On Earth" was one of Bing's better Christmas songs. It wasn't Nathaniel (he was only 15 at the time), but rather Kathryn (Bing's wife). In fact, at the news conference after his death she famously said, "I can't think of any better way for a golfer who sings for a living to finish the round." Here's a nice picture of her standing in front of a very nice portrait of Bing several years after his death. Thanks Chip for refreshing my memory. I do remember seeing Bing's children in the background at one point, and that is where I might be getting confused from, but again 33 years is a long time and I was only 19 at the time. I'm not even sure if it was from the same press conference or not. My memory ain't what it used to be lol. But for some reason, if I were to be in a name that tune contest and only heard 2 or 3 notes from the actual record, I could immediately identify the song and artist. Especially music from the mid to late 1950's and early 1960's. I do vaguely remember what Kathryn said at the news conference after his death, just needed to see in it writing to refresh my memory. I think too that somewhere there is the last picture ever taken of Bing and it was from the round of golf he had just finished before he had his heart attack. Hi all, first post. I spotted this thread but never saw any followup reviews. While I realize that many here focus on Ray Conniff or Mantovani, for me, nothing quite says Christmas like Bing Crosby. Being a sucker for all things Bing I just had to have this and I thought that I might hit the highlights. Track 1. It's beginning to look a lot like Christmas- IMHO this is Bing's finest vocal performance. He has an incredible command of his vocal skills here. 2. Rudolf- A lot of fun here with Ella Fitzgerald. Not usually my favorite song but this time I'll make an exception. 3. Just what I wanted for Christmas- great song, glad to have it. 4. Jingle bells- not much to say here, it's jingle bells. Nothing special but nothing poor either. 5. Christmas carol medley-well done, Bing in great voice again. 6. O come all ye faithful- great job, just sounds similar to other versions that I already have. 7. Here comes santa clause-Excellent. Another outstanding vocal performance with the addition of Peggy Lee. 8. White world of winter- not bad (Bing did not record a bad Christmas song) but not my favorite track. Definitely has a 70's sound to it. 10. Go tell it on the mountain- this track has been widely available on Sinatra's stuff. Frank's voice really overpowers Bing on this one. 11. White Christmas- I have several versions of this one by Bing. So many in fact that I can't keep track. Bing might be most famous for this one but it is also the most overplayed one. 12. It's Christmas time again-great song but it's not going to hit the billboard charts. 13. The Christmas song-excellent, so happy to have the full length version of this song. 14. Silver bells-again with Ella but I prefer the version on Best of and Voice of Christmas. Not sure who the duet is with, maybe one of the Andrews sisters? 15. Jingle Bells (fast Version)-decent but again as with #4 it's just Jingle Bells. Now if you want to hear a version that will knock your socks off go check out The Puppini Sisters, best version ever. 16. Sleigh ride- pretty standard version. 18. Silent night-Bing does a great job on this. It's impressive how he is able to convey the sense of reverence some of these tracks deserve. 19. The little drummer boy/Peace on earth-w/ David Bowie. Great SQ however the greatest disappointment on the album because they chopped off the entire beginning/introduction. Their conversation might have been staged but I still miss it. If you want the full version of this song you can find it on Bing Crosby's Christmas Classics (2005 version). In summary, tracks 1, 2, & 3 are my favorites but as a collector of all things Christmas and Crosby I'm thankful to have the unreleased material. If you own very little of Bing's Christmas music I would highly recommend his Voice of Christmas set over this one. It contains more of my favorites including Snow and Count your Blessings. Now if we could just get the studios to finally release a true soundtrack for White Christmas with Rosemary Clooney, Bing, and Danny Kaye all together. Edit: I may have inferred this but never actually stated that the overall sound quality on all the tracks is absolutely superb, especially considering the age of the songs. The songs White World of Winter and The Secret of Christmas are from the 1960s, not 70s. And Bing's singing partner in the original version of Silver Bells was Carol Richards, not one of the Andrews Sisters.